I picked up a fabulous book this weekend called 'Fairchilds Book of Window Display' by Shirley Joel. 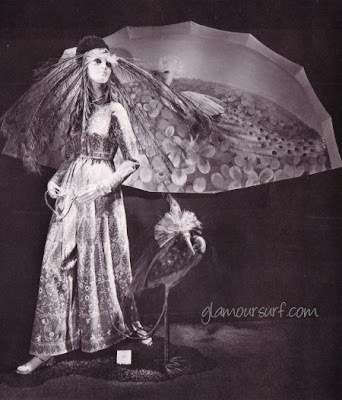 Published in 1973, the book is all about window display in the late 60s early 70s. 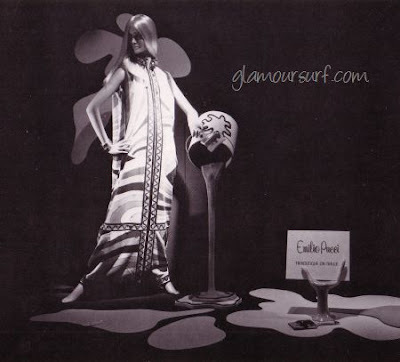 There are some phenomenal fashions shown in the book, unfortunately it doesn't credit the fashion designer or give the window display date but it does give some clues to them in the signage included in the display itself. Here are just a few, and of course we start with swimwear. This display is by Standa, and I can't find any information on them.. Anyone out there familiar with this company? I do love the display though with a large picture in the center. 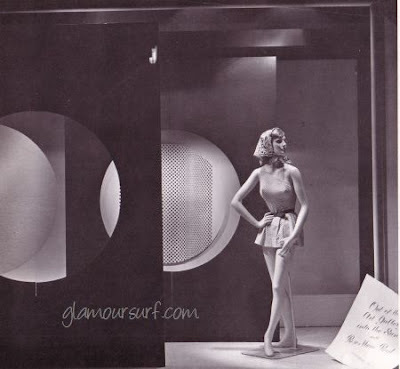 The caption reads: Standa, Milan, sets up a basic vacation display (that subsequently is picked up by all 212 Standa stores in Italy), built around a life size four color photo panel and chrome tubes. Individual stores can then follow through with appropriate merchandise. The one shoulder skirted swimsuit is by Rose Marie Reid. 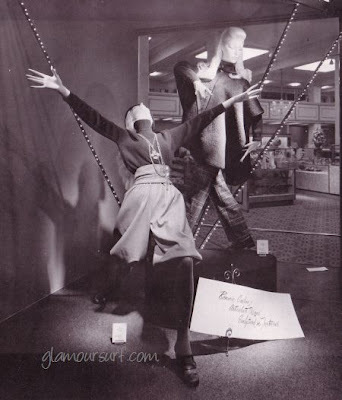 Although the mannequin is traditional, the mood of the window is modern. A single swimsuit is show by Hall Bros. Co., Cleveland, against modern shapes and designs that help underscore the clean-cut lines and print of the merchandise. Emilio Pucci , again, love this maxi dress by a brilliant designer. Who said you had to spend a fortune for a dramatic window display. Just when a few simple abstract shapes and bright colors and a witty hand-stand to hold the window sign, John Wannamaker, Philadelphia, makes a strong fashion statement. The added fillip of a suspended paint can pouring pretend paint is more difficult to execute, but within the talent range and capacities of most. Bonnie Cashin - Articulate Design Sculptured in Textures. I simply adore both of these outfits by one of my favorite designers. Dynamic duo. Two spirited mannequins capture the essence of a designer collection for Lipman Wolfe & Co., Portland. Even rows of tiny lights seem to be alive. Yet that's all there is to the window - nothing extra or extraneous. I'd love to know the designer on this one. Peacock feathers, peacock colors, peacock print, even the peacock. How's that for a fantasy window at Bergdorf Goodman, New York, that really isn't as complicated as it sounds. Basically it's a single prop that does it - peacock and feathers. 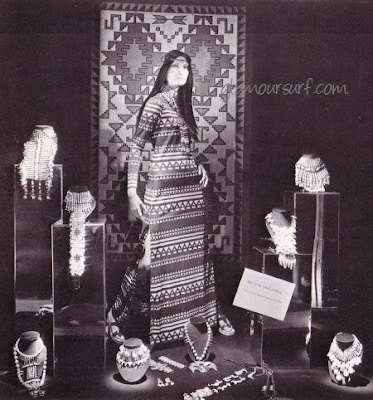 The American Indian given the full fashion treatment, Saks Fifth Avenue, New York, does it right with an authentic hanging for background, a chic mannequin got up in harmonizing outfit, and jewelry simply displayed on classic velvet forms set on mirrored panels. These bib necklaces would be so well back in fashion today! The book is done in all black and white, which I like but would have loved to see all these photo's in their glorious color. You can pick this book up here for pennies, it's well worth the investment in my mind if you like the fashions from the 1960s and early 1970s.